Constant Lambert's flamboyant personality is reflected in his seductive and occasionally outrageous scores that are being explored with sumptuous and fine regularity on Hyperion. This latest offering enshrines two rare ballets and both reel with dazzling orchestration and Waltonian like jazziness that was so typical of Lambert at his best. 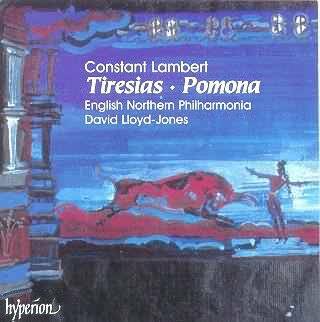 'Tiresias' in particular is orgiastic and sexually extremely alive with snakes and other evil animals taking on various guises, you can imagine what sort of music this imagination can furnish! Lloyd-Jones is wonderfully alert, especially in the highly complex sections where orchestral ensemble pretty well loses all sort of organized cohesion. The hour-long conception is perhaps slightly too expansive but the orchestra never loses interest and one cannot deny the imaginative flair that lies behind the score. With 'Pomona' we are in more familiar 'twenties' territory. The Roman setting is ideally conceived with the seductive whims of a feminine beauty dictating the proceedings, rather in the form of 'Salome'. In fact the music reminded me of Straussian opulence although at the same time you cannot fail to detect the Lambertian stroke of genius here and there. Lewis Foreman makes references to French impressionism and he could hardly be more right, this is impressionism, albeit in a British guise! Hyperion's clear and spotlessly clean recording sums up a brilliant release. The striking cover painting is just the right sales pitch for the collector to dig into his/her pocket for those few pounds that will complete a purchase of qualitative integrity.